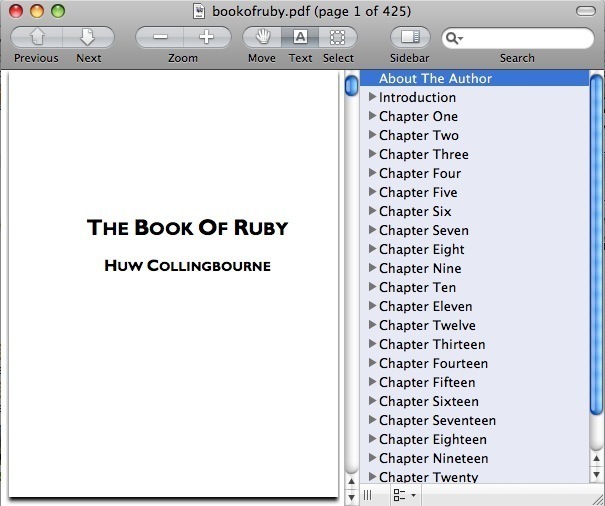 The Book of Ruby by Huw Collingbourne just released as a free PDF eBook. This looks handy. I've largely been unsatisfied with most Ruby books (especially the oft-referenced Pickaxe book) because they don't quite go to the depth that you need day-to-day. Often a Ruby hacker needs to resort to google-fu to understand certain particularly gnarly parts of the language. I flipped through this and it looks like a well written, well-structured overview of the Ruby language. Thanks to Huw for a great book and for providing it online here. I have yet to find a better writer of programming language books than Guy Lewis Steele, who invented the programming language Scheme and in part wrote C: A Reference Manual. Compiler writers consider it a better book than the standard by Kernighan and Ritchie. Does this book approach Ruby in a similar manner? If not, which one would? I'm not sure -- I know this one is certainly better than the canonical Pickaxe. For straight hackers who need to get stuff done, I also recommend "Ruby for Rails" by David Black. I believe David Black has a new book coming too, and I liked Ruby for Rails so much that I'll probably preorder it.